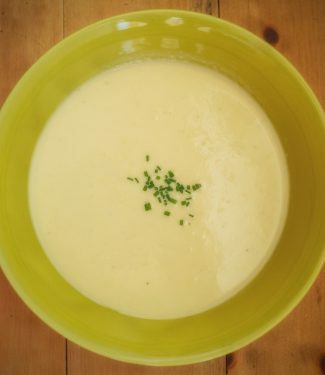 Without the truffle this soup is called potage parmentier when served hot and vichyssoise when served cold. I don’t think it has a name but truffled leek and potato is completely over the top. I just don’t understand why people don’t make more soup. People always love it. And it’s way easier than doing an appetizer plus you can make it ahead of time. Drop the appetizer from your menu and slide in a soup. Half the work and just as impressive. Ask yourself – would you rather be fussing with a fancy appetizer with the main course on it’s heels or ladle a bit of soup into a bowl. I vote for easy! You can make the basic recipe without the truffle and serve it hot or cold. If you do that, add a teaspoon of salt when you add the potatoes and then adjust seasoning at the end. If you are going to serve it cold make sure you check your seasoning when it’s cold. It will need more salt. Truffle salt is just that. Salt with bits of truffle. Unlike truffle oil which is an artificial flavouring agent (still tasty), truffle salt is based on the real deal. Purists will slam you for using truffle oil. I like the salt better but the oil is still a fun ingredient to play with. You can use truffle oil here if you want – I’m not with the truffle police. Either way it’s truffled leek and potato soup in my books. But please do try it with truffle salt if you can. It’s a whole different level of wow. 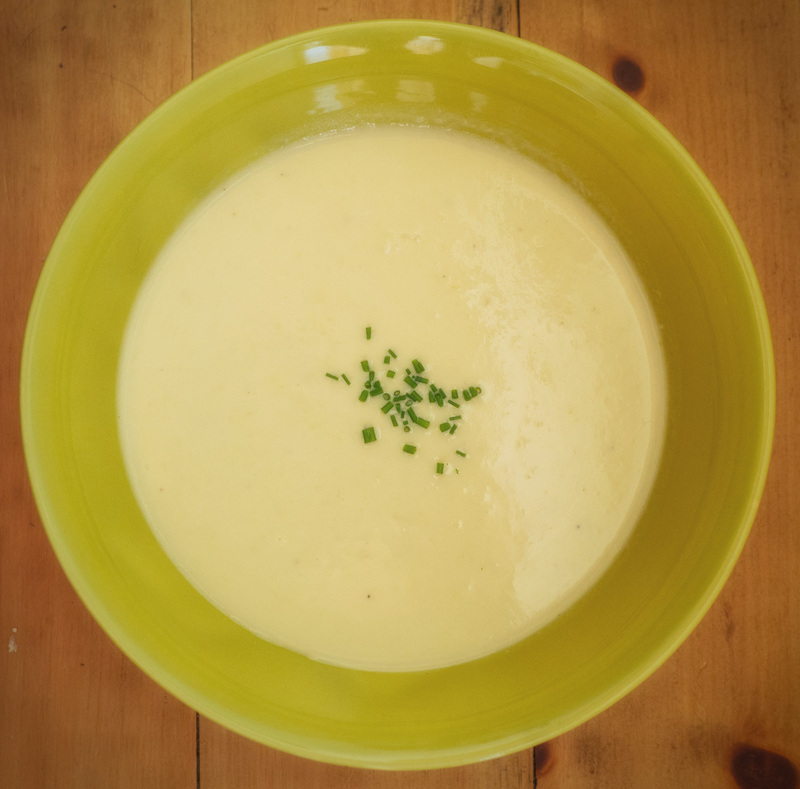 Truffled leek and potato soup. Comfort food elevated to something truly special. Melt the butter over medium low heat and gently cook the onions and leeks until soft. This could take as long as 10 minutes. You do not want anything to brown though. Add the diced potatoes and chicken stock and simmer until the potatoes are tender, around 15-20 minutes. Let cool slightly and puree. You want to really puree - no lumps here. That's why waxy or even yukon gold are high risk. Pureeing waxy potatoes is a good way to make glue. Not good. One little trick to be aware of. If you are pureeing in a blender you need to take the little cap in the middle of the top out to let the steam escape. Not doing this is a pretty good way to get soup on the ceiling. At this point you can either finish it off or just let it sit until dinner time. If you let it sit, reheat to the barest simmer to serve. In either case you will not let this come to a simmer again after you add the cream so plan accordingly. Add cream to the hot soup and then season with the truffle salt/oil and white pepper. You want to add the truffle salt just before you serve. I find the flavour weakens if you cook it.